Enriched with Sea Kelp and Green Tea, this microdermabrasion scrub safely and effectively removes dead skin cells leaving skin retextured and silky smooth. Use prior to shaving for best results. Paraben-Free, Sulfate Free, Gluten Free. All skin types. This masque will help remove the environmental toxins, dirt, and debris that build up on your skin and clog pores. It is specially formulated with Charcoals and Clays to provide a two-pronged approach to cleaner, healthier skin. Paraben Free. A non-drying soothing gel mask formulated to lift impurities, minimize pores, and soothe the skin. 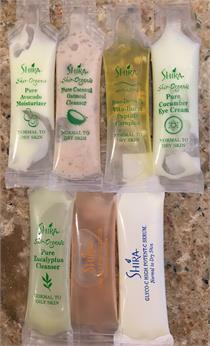 Herbal extracts gently hydrate as they relax and refresh the skin. Cools, purifies, and leaves skin with a clear and natural radiance. Paraben Free. This deep-cleansing masque helps restore radiance by eliminating toxins and impurities and energizing the complexion, revealing a healthy, youthful glow. The thermal, charcoal formula is activated with water, to melt away debris. A vital addition to your moisturizing routine. This refreshing, vitamin-enriched mask revitalizes thirsty skin. A potent blend of Chamomile and Vitamins A, C, and E will leave skin comfortably nourished and hydrated. Peel away imperfections and brighten up! This illuminating peel-off masque absorbs excess oils and removes impurities from the pores. Powerful antioxidants give your skin a smoother, more radiant appearance. A gentle nutrient rich exfoliating scrub that helps to eliminate embedded impurities, stimulate circulation, tone and smooth skin. Natural almond granules sweep away dull surface cells, revealing clear and radiant skin. Serves a double-purpose: exfoliates and deeply cleanses. Is based on gentle non-dehydrating ingredients. Removes dead skin cells and promotes cell renewal. Stimulates blood circulation. Enhances a silky texture.